After a dramatic decline in mountain gorilla populations following their scientific discovery in 1902, conservation efforts have helped their numbers to slowly grow. The recent popularity of trail cams and camera traps has resulted in some pretty amazing footage of the natural world, such as that of Bhutan’s mountain tigers and a cougar’s epic journey. On May 9, 2012, another amazing “catch” was made: National Geographic captured a view of Cameroon’s Cross River gorillas. Of all of the gorilla species, the Cameroon Cross River gorilla (Gorilla gorilla diehli) is thought to be the most in danger of extinction. Estimates are that there are fewer than 300 left in the wild, with just one individual known to be in captivity. The Cameroon Cross River gorillas are likely a subspecies of the mountain gorilla (Gorilla beringei beringei). Only about 786 mountain gorillas are thought to exist. They are split almost evenly into two groups—one in the Virunga range of volcanoes on the Uganda-Rwanda-Democratic Republic of Congo (DRC) border and the other in Bwindi Impenetrable National Park, Uganda. 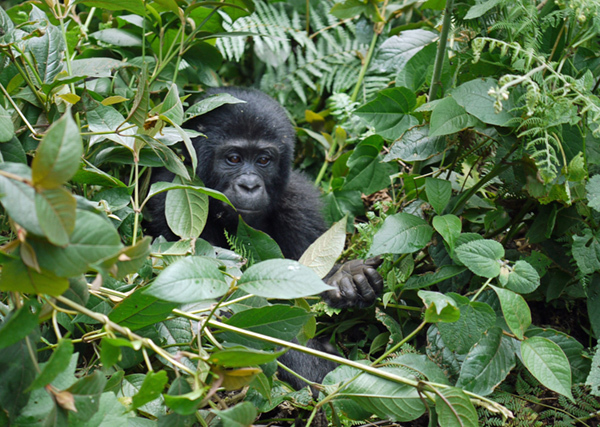 Loss of habitat and intense hunting for bush meat are major threats to both the Cross River gorillas and mountain gorillas. In 2004, in fact, illegal settlers in Virunga National Park, DRC, cleared 3,700 acres of prime mountain gorilla habitat for agricultural land. The good news is that conservation efforts have led to an increase in the Virunga population of mountain gorillas by 14 percent in the last 12 years, while the Bwindi population has increased by 12 percent over the past decade. Regarding the Cross River gorillas, in 2008, the government of Cameroon created the Takamanda National Park on the Nigerian border. The park now forms part of an important protected area with Nigeria’s Cross River National Park, safeguarding an estimated 115 gorillas—a third of the Cross River population—along with other rare species. Watch the National Geographic footage of the Cross River gorillas below. Let’s hope this film won’t become all that remains of them anytime soon. Wonderful and increadable capture. Thank you for sharing, a rare footage. They’re beautiful and powerful animals. Thanks for posting! magnificent animals! Thank you for sharing this footage. Thanks for the link. You are right. Great footage.